As the BA (Hons) Furniture and Product Design course has small class sizes, it allowed much more of a personal experience with my tutors. What do you enjoy most about the course at NTU? “As the BA (Hons) Furniture and Product Design course has small class sizes, it allowed much more of a personal experience with my tutors. Having different tutors over the years is also critical because design is such a personal thing that everyone teaches and perceives it differently. The tutors are great at giving constructive criticism whilst still remaining positive about a design you’ve made. 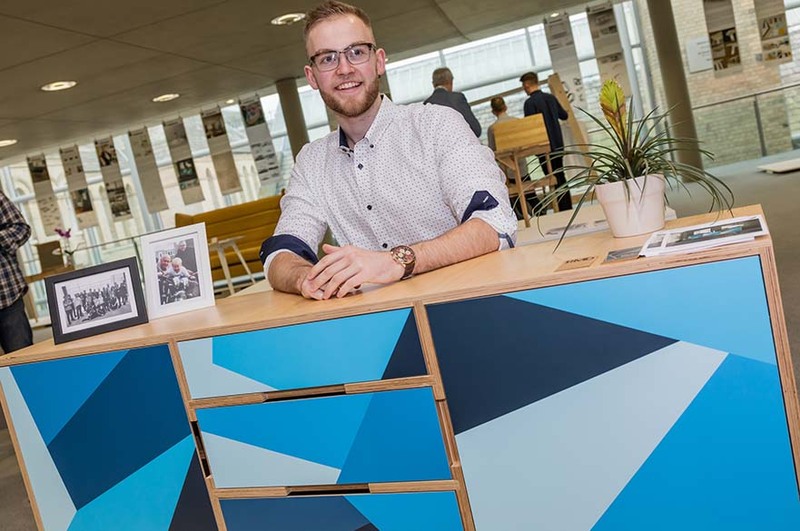 “In my first year of study all BA (Hons) Product Design and BA (Hons) Furniture and Product Design students were given a competition brief. The brief was to design: ‘solid wood furniture, influenced by the area surrounding the Bayerischer Wald’. The project itself related to a forest in Bavaria which is home to specific species of tree that local surrounding craftsmen have used for centuries. My design was a dining table that could be bought with limited modifications to help ensure that it would be convenient for any sized home. It was chosen along with others to be shown at an international design fair in Germany. What did your placement year involve? My first placement was six months long which was with an NTU Alumni who graduated from BA (Hons) Furniture and Product Design. I shadowed him closely for the period, learning very precise woodworking skills and techniques. My second placement was seven months and was also in my hometown. This was working in a small business for a local entrepreneur-designer. How do you think your experience will this enhance your employability? "I’d say that all of my experience and skills have allowed me the ability to function as a working professional. I no longer worry about the prospect of working in an office with strangers, or feel that self-employment is out of reach. I am especially confident in my own skills that I have honed while both studying at NTU and in my own free time, this has given me the confidence to challenge people and clients with my experience and opinion."